More than one in 20 people are living with Type 2 diabetes without realising it, research reveals. A survey of 1,000 Britons by Diabetes UK found that 6% had no idea they were suffering from the lifelong condition. 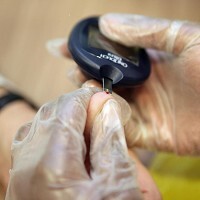 The charity is therefore urging more people to come forward and undergo its risk assessment, which can be taken in a pharmacy, a GP surgery or via the internet, to find out whether they are unknowingly at the mercy of Type 2 diabetes. Those who find out they have the condition don't need to let it dramatically change the way they live their lives. Medical travel insurance means sufferers can still enjoy holidaying to all four corners of the world. There are currently 3.2 million people in the UK living with Type 1 and Type 2 diabetes, while a further 630,000 are estimated to have Type 2 diabetes but are not yet diagnosed as having the condition. Furthermore, it is believed that up to seven million people are at high risk of developing Type 2 diabetes at some point in the future - and if trends continue at the current rate, an estimated five million people will have the condition by 2025. Type 2 diabetes occurs when the body doesn't produce enough insulin to function properly, or the cells in the body don't react to insulin. Risk factors include being over the age of 40 or over the age of 25 if from a South Asian, African Caribbean, or Chinese background, having a close relative with diabetes, being overweight or having a large waist. If left unchecked, it can lead to devastating health complications such as amputation, blindness and stroke in the most extreme cases. Barbara Young, chief executive of Diabetes UK, says people with Type 2 diabetes need to be diagnosed as quickly as possible so they can get the education and healthcare they need to be able to live with it. Unfortunately, at present, half of people with the condition already have signs of complications by the time they are diagnosed.